Jeffrey A. Muszynski is a civil litigation attorney focused on helping people when they are injured. He enjoys getting to know his clients on a personal level and working to help his clients and their families recover from what are often difficult situations following an injury. 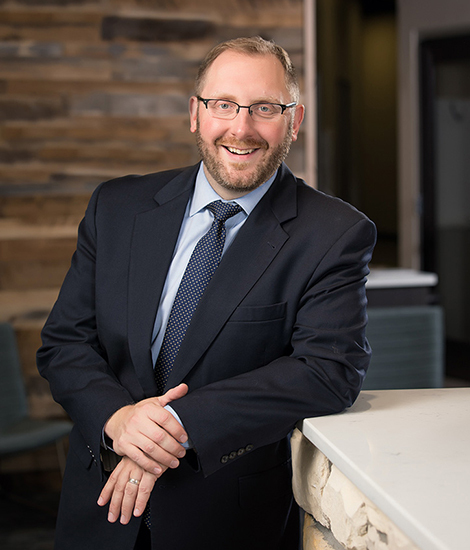 Before joining Bye, Goff & Rohde, Jeff worked as a defense attorney and is very familiar with how insurance companies and businesses defend personal injury cases. This experience gives him a unique perspective and enables him to predict what the insurance companies will do to prevent you from a fair result. When the opportunity arose to switch his practice to Bye, Goff & Rohde, he jumped at the chance to help individuals rather than work for insurance companies and big corporations. Jeff takes pride in knowing he can help his clients get their life back on track after an injury. Jeff grew up in Milwaukee, Wisconsin. Jeff was a high school teacher before becoming a lawyer and he uses those skills to teach a jury and the judge about his client’s story. He went to law school at William Mitchell College of Law in St. Paul, Minnesota, graduating with honors. After law school, Jeff clerked for the Minnesota Court of Appeals before working at large defense firms in downtown Minneapolis. As a lifelong fan of the Milwaukee Brewers and Green Bay Packers, he is happy to be back in Wisconsin after joining Bye, Goff & Rohde. He lives in River Falls, Wisconsin with his wife, two children, and dog, Cooper. In his free time, he enjoys playing soccer, softball, fishing, and watching his kids’ dance recitals and soccer games. Jeff is involved in the local community as the bar association representative to the Pierce County Criminal Justice Coordinating Council. He currently serves as the President of the River Falls Soccer Club Board.